You can easily improve the appearance of your home by incorporating a waterscape into your front yard. Water adds a great touch to your landscape and can help make your home more inviting. Not to mention the addition of a water feature also improves the value of your home! The following water features are not only beautifully refreshing but require very low maintenance as well. See if there’s one you like! A Pondless® Watefall is basically a waterfall without a pond, and is sure to make your home stand out from all the others when you place it near the entry to your home! The Pondless® Waterfall can be easily incorporated into small spaces while still allowing you to enjoy the sight and sound of running water. Shallow streams and Pondless Waterfalls are a great option for those who have small children since there is no pond to contend with. Plus kids love playing in the water and will delight in all the critters that come to visit the water feature. Wind your stream around the front of your home or have it meander through your favorite garden bed. Fountains are the perfect way to add a splash of water to your landscape and add architectural interest to your landscape, as well! This trio of bubbling rocks sounds beautiful and attracts birds and butterflies to your home. Why stop at 3 fountain rocks? The impact that a fountain can have on your front yard is quite dramatic. Fountains can typically be found in kits; they come in a variety of styles and sizes and can be installed in just a couple of hours. If you love the sound of water, a fountain is your perfect beginning. Group as many of them together as you like! An ecosystem pond can also transform your home’s appearance from Plain Jane to the house everybody talks about as they drive by. Can’t you just see yourself lounging in the Adirondack chairs while drinking in the view? Not every house you see has koi greeting you as you walk to the front door. An avid koi lover lives in this home. A water feature can completely transform your landscape. This lucky homeowner added a stone bridge to the front door. Everyone crosses over the stream and waterfall when they come to visit! 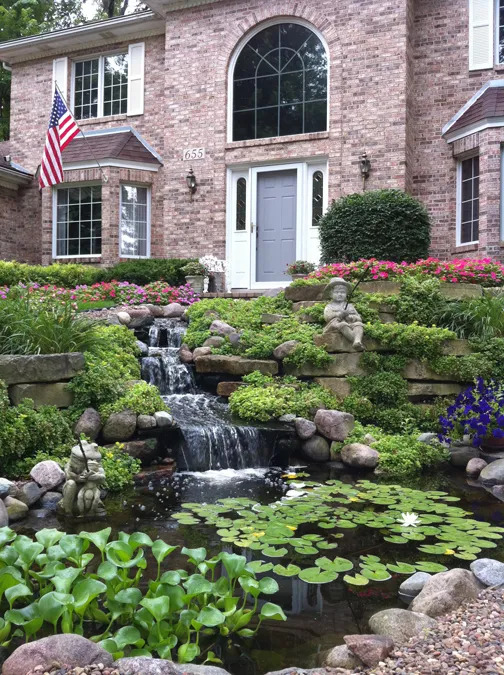 Imagine greeting your guests as they walk into your home with a beautiful waterfall and pond like this one. Who says a water feature has to be relegated to the back yard? Newer Post How a Pondless Waterfall Created an Outdoor Retreat Older Post Who Doesn’t Want the Perfect Backyard?